John Linaker was a grand all round athlete who ran well on all surfaces – road, cross-country and track (both indoors and out). Colin Youngson has covered his career below in some detail but it might be appropriate to say a word or two about his predecessor as Scottish steeplechase record holder, T.P. O’Reilly of Springburn Harriers. Tommy was a fine athlete who trained hard and raced hard – and raced a lot! He loved the Highlands of Scotland, particularly those of the West Coast and raced all over the highlands: Kinlochleven, Spean Bridge, Fort William and many more. A keen gardener he collected specimens of heather from wherever he was racing and transplanted them to his own garden at home in East Kilbride. He sang in the Gaelic (he had a fine singing voice) and many a bus trip home was enlivened and enriched by Tom singing at the back of the bus while all those who had just run in the Mamore Hill race slumbered their way home. But he loved to run and had a whole string of race successes to his name. 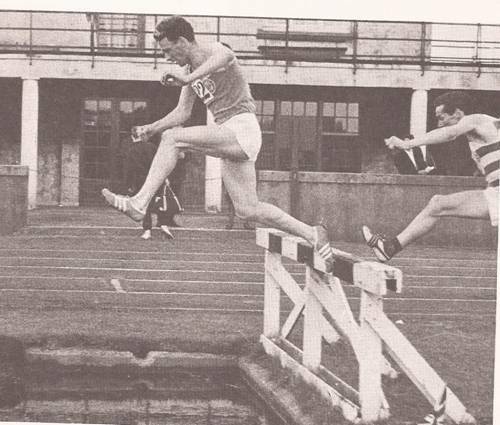 One of the first sports meetings I attended on demob after National Service was at Ibrox Park where Tom won the steeplechase – in those days it was the done thing to place hedges in front of the water-jump barrier (see the picture on Bill Ewing’s page) and just ran away from all the other entries. It was no surprise to find that he had just broken the National Record for the steeplechase – in fact it was the first ever recorded record for the 3000m steeplechase. He ran in many Edinburgh to Glasgow races for his club, ran in many National Championships and turned out in all the wee Tuesday night inter-club fixtures that helped fill up the programme in the 1950’s and 60’s. Remember too when you look at his times, not only was he leaping the hedge as well as the barrier and water, he was running on cinder tracks as well. He was a remarkable athlete and still turns out in SVHC races from time to time as an M70. Although Tommy was a talented athlete who ran well in the steeplechase, he was not a true specialist. John was. I agree totally with Colin’s ‘take’ on the situation – John Linaker was the man, above all others, who turned the event from a refuge for those who had not quite made it, to one for genuinely fast men who had the technical ability to deal with the barriers at speed. What follows is Colin Youngson’s profile of John Linaker. “Two weeks later it was Lachie Stewart’s turn to shine, this time at the AAA Championships where he finished third behind two very good GB steeplechasers, Maurice Herriott (seven AAA steeplechase gold medals and one bronze and Ernie Pomfret (five silvers and one bronze). Lachie’s time was a Scottish National Record of 8:44.8, the fastest time he ever ran. Lachie did have the satisfaction that season of representing Scotland at the Empire and Commonwealth Games in Kingston, Jamaica, and Great Britain at the European Championships in Budapest, although he didn’t really run up to form in either of these events. John Linaker, however, running for Scotland produced a great run at Kingston, where he finished seventh with a brilliant 8:41.6. After that he competed for another season or two but never regained his 1966 heights.” However John’s 10000m best – a very good 29:17.2 – was set in 1968. As has been mentioned, John Linaker was also an outstanding cross-country runner. Running for Kirkcaldy YMCA, he won the East District Youth Cross-Country Championship in 1958 and was second in the National Cross-Country Youths (Under 17) race. The next year he represented Pitreavie AAC and moved up to first in the East Junior and second in the Scottish Junior. Then in 1960 John Linaker won the Scottish Junior Cross-Country Championship, 51 seconds clear of Jim Alder! Previously he had triumphed in the East District SENIOR CC! He also beat Andy Brown to win the Scottish YMCA Championships. In 1962 he was eighth in the Senior National for Motherwell YMCA. His greatest cross country triumph was in 1963 when he won the Senior Scottish title and led his team to gold. Colin Shields wrote in the SCCU centenary book: “The Motherwell pair, Andy Brown and John Linaker, together with Alastair Wood (Aberdeen) went into an early lead, drawing well clear of the field. Running together as a group they were out on their own with just a mile to the finish when Brown, hoping to retain his title, broke clear with a strong burst. But his rivals were faster finishers than him, Linaker being SAAA Steeplechase champion and Wood Three Mile champion, and they overtook him with half a mile to go. Linaker timed his finishing sprint to perfection winning by ten yards from Wood with Brown a further ten yards behind. Motherwell won the team race by just nine points from Edinburgh Southern Harriers.” John Linaker was selected for the Scottish team for the International Cross-Country race at Hippodrome de Lasarte in San Sebastian. Andy Brown finished first Scot home in eleventh position with Alastair Wood31st, John Linaker 36th and Scotland finishing eighth team. By 1966 he was running for Pitreavie AAC once more and finished fourth in the Senior National behind Fergus Murray, Lachie Stewart and Jim Alder. In the International CC Race at Rabat, Morocco, John Linaker was 34th. Lachie Stewart was 12th, Ian McCafferty 14th and Jim Alder 16th. With Andy Brown 48th and Jim Johnstone 78th, the Scots were sixth and chagrined to miss a bronze medal by only 18 points. This was followed by a poor National for Linaker in 1967 – 21st but many in front were from the New Zealand team. However he finished fourth in 1968. Athletics Weekly reported: “After about two miles, Lachie Stewart (Vale of Leven), Alistair Blamire (Edinburgh University), John Linaker, and Jim Wright (Edinburgh Athletic Club) were out in front with a yard covering the four of them. The next two miles saw no further change. Reaching six miles in 30:00, Blamire led Linaker by four yards with Stewart and Wright close behind. With a mile to go, Blamire still headed the field with Stewart now fighting back. With half a mile to go, Stewart took a narrow lead, and although Blamire fought hard, the reigning champion retained his title by a five yard margin. JL Stewart 37:09; 2. A Blamire 37:10; 3. J Wright 37:20; 4. J Linaker 37:23.” Linaker was selected for the International CC in Tunis but did not count for the team in 57th place. John Linaker’s last success in the National was eighth place in 1969. Although Pitreavie AAC did not take part in the Edinburgh to Glasgow Relay, John Linaker became a member of Motherwell YMCA during 1961 to 1963 and his new club had considerable success in the premier winter road race. In 1961 Motherwell ended up with a bronze medal but Linaker’s impact on the event was explosive. Running the Second Stage he siurged from thirteenth to second, creating a new stage record of 28:54, 56 seconds better than the second fastest man – future international Calum Laing of Glasgow University – could manage. Motherwell YMCA won the race in 1962 and 1963. 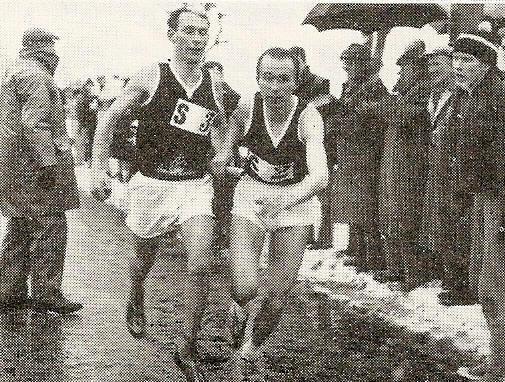 In the former, John moved his club into the lead with the fastest time on Stage Six,1:32 better than his rivals; and in the latter he repeated the feat with 32:20, only five seconds off the record, overtaking the well-known international Alastair Wood of Aberdeen AAC and finishing 27 seconds faster than him. Having obtained two gold medals and three fastest times, he did not run in this race again, having moved back to Pitreavie AAC. Nowadays in 2011, John is still very active indeed: getting great satisfaction from planting thousands of trees on estates; recording programmes about walking routes and music for Hospital Radio; cycling and acting as volunteer Manager at Scottish Youth Hostels. Looking back at his career he tells a tale of outpacing his girlfriend round his five mile loop when she was on a bike – so she didn’t speak to him for a week! On another occasion, he was left lying spread-eagled on the pavement after failing to jump an 18inch garden fence, and then had to explain to his girlfriend’s mum why the fence was in two pieces: a difficult task when he was supposed to be the Scottish steeplechase champion! John reflects that at times he used to train too hard but this was because he loved running longish distances. The results he achieved were not because of a deliberate aim of clobbering everyone in sight, but just the result of training hard. He feels that distance runners get tremendous pleasure from running up and down hills through the countryside in every season and all sorts of weather. He is not sure that some modern athletes – perhaps training on a track with a stopwatch and pulse monitor – gain similar pleasure. The race itself may be the end result but it is not the only thing that matters. John is not uninterested in athletics history but suggests that it is nearly impossible to transmit some feelings that linger in the memory: that last hurdle, that last charge for the line, with the mind saying go on, go on, while the body pleads for release. Still articles such as this may let future generations know that we were not always a bunch of geriatrics! I have two main memories of John Linaker – one from 1966 and one from 1999! My first Senior race was in early October 1966 at the Kingsway Relays in Dundee. I was warming up with mu Aberdeen University team mates, jogging round the course in reverse. We reached the top of the finish hill and gazed down the path which ran between Caird Park and the Kingsway itself, in order to watch the first stage runners approaching. To my awe, a lone runner appeared and rapidly came nearer, an incredible distance in front of his unfortunate pursuers. The champion, running with power and total control, turned out to be John Linaker of Pitreavie, an athlete who had not long returned from the Commonwealth Games in Jamaica where he had run faster than anyone previously representing Scotland with a steeplechase time of 8:41.6. Over 2.9 miles he was more than two minutes faster than I managed and at the time I could only dream of being anything like as fast as him. From 1986 onwards, in the M45, M50 and M55 age groups, John Linaker made a comeback to veteran athletics, setting an impressive range of Pitreavie AAC records for 800m, 1500m, 3000m, 5000, and 10000m and the London Marathon in 1997 in a fantastic M55 time of 2:40:46. In 1990 he won the M50 title in the Scottish Veterans Cross-Country Championships. He won three M55 Scottish Veterans titles in succession from 1995 – 1997. In addition in 1992 he won the M50 800m and 1500m in the Scottish Veterans Indoor Championships. he coached his daughter Isobel who broke the Scottish Under 15 records for 800m and 1500m in the early 90’s and was selected for the European and World Schools Championships.